An active time for Ananda residents! 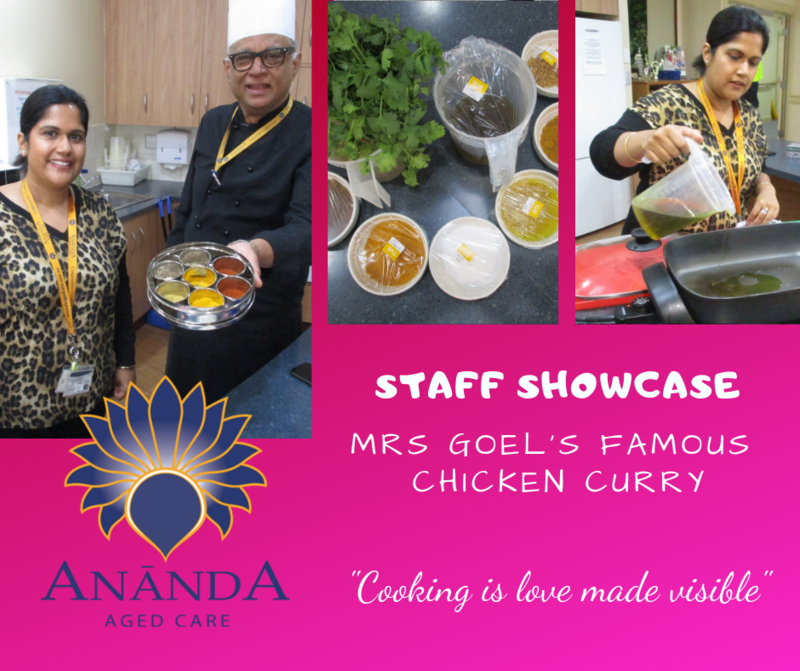 It has been a very busy few months at Ananda as we transition to the new Aged Care Standards. We are in the process of developing a new model of care called the Ananda Resident Focused Care model and are increasing the choices and preferences of residents, and have at both sites moved away from a task oriented approach. At Hope Valley we have merged our care and lifestyle teams under the management of our Clinical Nurses and Nurse Manager. We have introduced “Ananda around the World” where we take a trip to a new country every month. We learn fun facts about the country, learn a traditional recipe (and taste) and we then have a themed lunch served. We have had Africa, Thailand, India, America…..moving around the globe at a rapid pace, and next we will say bonjour et bon appetit to France! We have introduced the concept of “Ananda Anytime” which encompasses a concept of a 24/7 snack menu available for all and is an in between meal option. 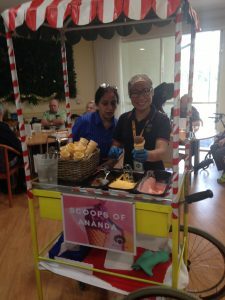 We have created “Scoops of Ananda” which is a purpose-made trolley (thanks to Vince at Hope Valley) that allows for food to be kept chilled. Ice cream was enjoyed during the warm days and a cheese and antipasto platter was served on this trolley when celebrating International Cheese Day recently. We are in the process of moving towards the popular bain marie system. This will create 3 choices per meal and served in the dining room and will change the concept of a tray style lunch and allow for interaction and more choices per meal. Resident we see and smell the food on offer, and it will always be hot. We have also started creating a different environment for meals – fresh white table cloths, napkins and menus presented to create a true dining ambience, and where residents wish we provide relaxing music and limit the volume at meal times. Recently we have had staff showcase their talents and look forward to many more through the year. So what is next on the menu? The introduction of pub lunch outings at both sites- The first one for Hope Valley was successful on Monday 18th March. Book your spot for the next one now! Introduction of tiered priced outings – movies, coffees, walks and lunches (both sites). “Ananda Fine Dining” restaurants set up on the 3rd Friday evening of each month at Hope Valley (BOOKED OUT March 22nd) and fourth week of the month at Findon (Some tables still available for March 29th BOOK NOW!). Families, guests and residents will dine in a fine dining environment. Book ahead now for future months! The pool table is coming to Hope Valley as well as a mini ‘pitch and putt.’ Residents are able to engage in meaningful social activity whenever they like. Coffee! Barista quality coffee from coffee machines – gold coin donation – have a proper coffee with guests or family.